A viewer would hard-pressed to find a more beautifully shot, atmospheric horror film than Dario Argento’s Suspiria. Argento’s, and cinematographer Luciano Tovoli’s, vivid production has become legend among horror fans, and for good reason. The film exists within a reality all its own, shifting back and forth between dreamlike and nightmarish, soft and menacing, as the situation requires. No study of horror films, and film in general, is complete without seeing this classic. From 1977, Suspiria stars Jessica Harper as Suzy Bannion, a dance student who has been invited to study at the prestigious Tanz Dance Academy in Freiburg, Germany. Strange happenings begin immediately upon Suzy’s arrival at the academy (played on the exterior by a real location called The Whale House). She is greeted by a student who is fleeing into the night, and is herself turned away at the door, despite a driving, soaking rain. Argento didn’t waste any time, packing this first sequence with some of the atmosphere that would come to define the movie. The Whale House is a gaudily painted relic, and the onscreen action is accompanied by an iconic soundtrack by an Italian band called Goblin. Goblin’s music is Mike Oldfield-esque, in that it’s evocative of the opening notes of Tubular Bells, which was used to effect in The Exorcist. Argento liked Goblin’s work for the film so much that he overuses it, pounding the same hook over and over again into the audience’s brains. Suzy finds a hotel for the night, but meanwhile the mystery girl flees to the apartment of a friend, and it is here that we get our first glimpse of the incredible interiors used for the film. Production designer Giuseppe Bassan created technicolor imitation Art Deco interiors. Combined with the lighting, rich with color filters, all the sets become removed from anyone’s normal experience. Visually, this is one unique movie. The plot is pretty good, too. The fleeing student is murdered, along with her friend, and it sends the dance school into a tither, but only for a few minutes. That’s because Suzy finally gains admission to the school and begins her studies. Everyone seems to have moved on from the student’s, whose name was Pat (Eva Axén), death, except for her roommate, Sara (Stefania Casino). Sara is convinced that someone at the academy is responsible for Pat’s death, and she draws Suzy into an amateur investigation. Meanwhile, classes continue, led by the matronly Miss Tanner (Alida Valli) and deceptively tyrannical Madame Blanc (Joan Bennett). Those two have taken an interest in Suzy, and that might not be a good thing. The remainder of the film focuses on Suzy as she delves into the mysterious goings on at the academy. She wanders its halls exploring all its secrets, almost childlike in her curiosity. She seems unaware of the danger in which she might be placing herself, despite the fact her curiosity was roused by a grisly death. Her lack of fear for her own safety doesn’t make much sense, but it allows Argento, who shares screenwriting credit with Daria Nicolodi, to keep putting her into danger, and there wouldn’t be much movie without that. 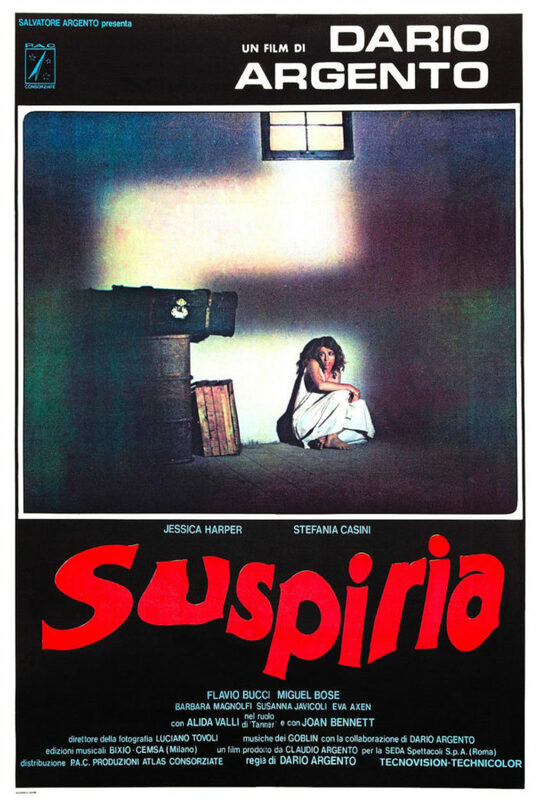 Suspiria is one of those Italian films that had a multinational cast speaking multiple languages during filming. That means all the performances are dubbed. The quality of the dubbing is no better or worse than any other Italian flick, either a classic or a bottom feeder. It’s just a feature of Italian cinema. Thankfully, the dubbing doesn’t have a deleterious effect on the performances. A couple of the bit players are simple and amateurish, but the main players acquitted themselves well. Harper was a good lead, although a touch old for the part, while Alida Valli was the standout of the cast. Her part may have been too close to the stereotypical headmistress or mother superior, but she does well as the film’s stern authority figure. Veteran German actor Udo Kier also appears in a sole scene, his character providing exposition and context to both Suzy and the audience. There’s nary a list of the greatest horror films of all time, or the greatest Italian films of all time, that doesn’t have Suspiria somewhere on it. Sometimes it walks a fine edge between art and ridiculousness, but Argento always pulled back just in time. Its story is entertaining and, while they can’t measure up to the atmosphere, the frights are there, as well. The scary moments aren’t what this film is remembered for, nor were they Argento’s main focus. Instead, this film is a pageant of horror — a journey into a hallucination, where the very light and air can be breathtaking.